I am in an Indie Fragrance group on Facebook and Possets often comes up in discussion. I went on a new-to-me perfume oil bender a few weeks ago and Possets was one I visited. Madame X came up as a beloved blend so I went ahead and sprang for it. Possets sells their perfume oil in 6ml ($20), 10ml ($31.66), 15ml ($45.00) and 30ml ($85) bottles. 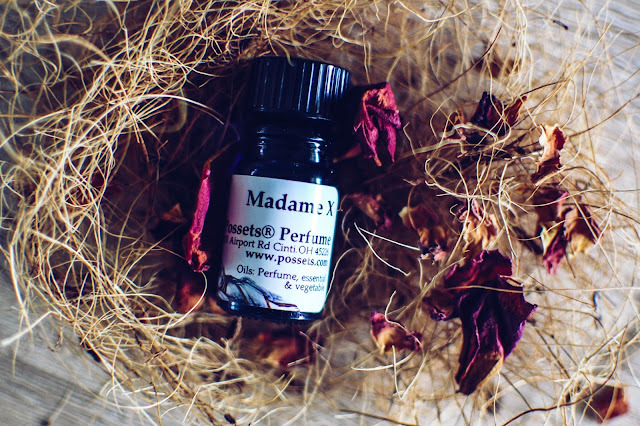 Madam X- Notes: Skin musk, wax, cream, lemon zest, champagne, and a kiss of bitter vanilla. Be careful when opening! These cobalt blue vials are generously filled to the tippy top. In the bottle, it smells of the soft powdery vanilla and faint plastic of cherished childhood baby dolls. I believe it is the wax note that smells of the doll skin. Applied wet on the skin the cream blooms becoming the remnants of a milk bath clinging to the pelt after a late afternoon soak. The lemons and champagne don't feature on my skin in any outright manner but their light and warmth bubble up through the creamy vanilla. As the scent dries and melds into the skin, the vanilla cream is sealed with a drop of wax. She Walks in Beauty- Notes: Black oude, musk, sandalwood, artemisia, rue, Arabian white oude, pettigrain, elimi, silk essence, black tea, and a mystery note. She Walks in Beauty lifts from the vial in a verdant landscape of pettigrain and the evergreen scented ghosts of elemi. Dewy on the skin, she still strolls in her grassy fields, the breeze heavy with the must of rue and spore of the rustic flora. As she grabs the sunset glow into her hands and escorts the beams down into the warm folds of the Earth, she trails behind her the effluvia of comforting tea, snug sandalwood dreams, the musk of embraces yet claimed. The final moments of the scent grow dusky with the twilight haze of oud smoke and chilly with silken star light as it evanesces. Landscape in Suffolk- Notes: Oakmoss, bergamot, lavender and coumarin. Spry bergamot and lavender painted in shades of pine and vanilla swell from the glass tube as it passes under my nose. Damp on the skin the lavender billows out in a pillowy soft cloud of velvety lavender buds and powdery vanilla. Into the dry down an edge of oakmoss sharpens the lavender and lends a delicate feathered sage tone even deeper into the final moments of the bouquet. 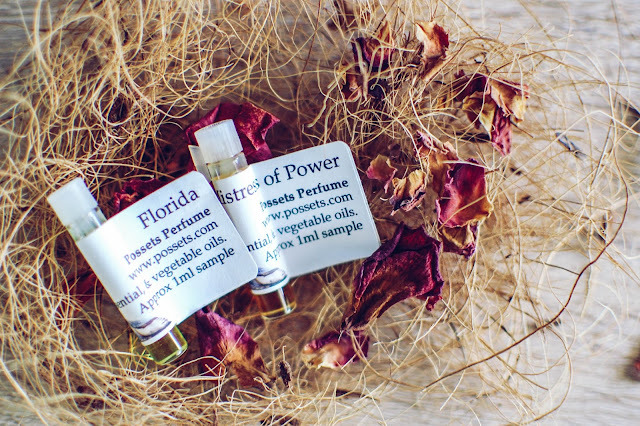 Florida- Notes: Several natural orange essences, musk and spices. In the imp, Florida is a honeyed sub-tropical concoction of guavas and tangerines. Poured onto the skin, juicy tangerines merge with tart Meyers lemons and candied Ruby red grapefruits and kumquats. The citrusy brew releases effervescence and tartness, it starts to bubble up into a tropical fruit punch heavy with papaya and mango nectars. Eventually the Carmen Miranda samba potion dries into a softer orange blossom and pineapple and Valencia orange veil of fruity gentleness. Mistress of Power- Notes: Black, grey and golden musks, dark aged patchouli, chocolate liqueur, clove and an ambergris-like musk. Boozy bittersweet chocolate liqueur fumes curl from the sample vial. Wet on the skin, amber and suede and dark unsweet cocoa dust waft forth. The sillage from a distant smells slightly indolic with ripe jasmine but softens when smelled closer to the skin. The dry down turns earthy with patchouli and musk and the ever present dark cocoa. Several hours into it the black patchouli reigns supreme. 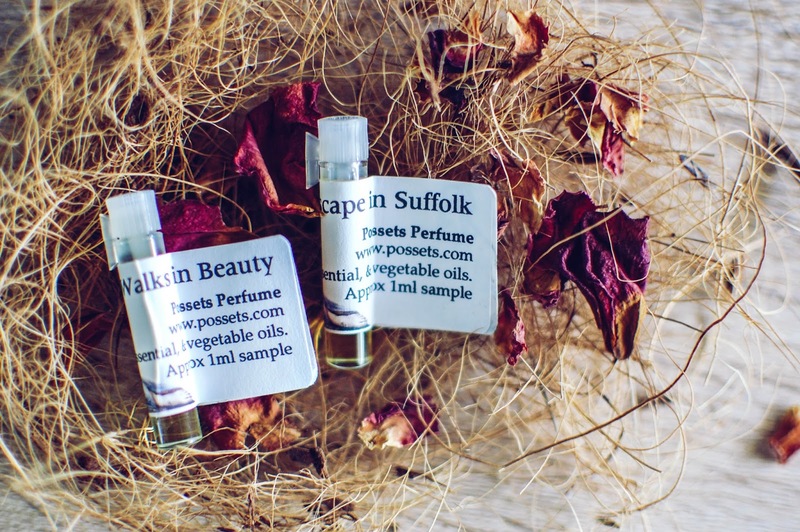 I enjoyed sampling and wearing all these scents but I think I would spring for She Walks in Beauty and Landscape in Suffolk for a full bottle out of all the samples. Possets will be visited again in the future I am sure. Do you have any Possets favorites? Let me wipe my mouth 'cause your descriptions got me drooling! Wow Julie you just have a way with words. I do believe you were born for blogging! I have some old Possets samples I need to drag out. Please let me know the name of the Indie Facebook group. I'm intrigued. Thanks! Oh! Ok! I will add you! Let me know if you have any Possets recs! Sometimes I have that happen with a company too. Whatever base they use won't work for me. Madame X was nice but that wax note kept me from loving it. I will probably give it to my sister and try some other ones. I did try Alkemia for the first time! I will post it in a couple weeks after I wear it some more. You are right. The price is excellent!! If you find any I HAVE to try please let me know! You have a beautiful holiday weekend too my lovely friend!